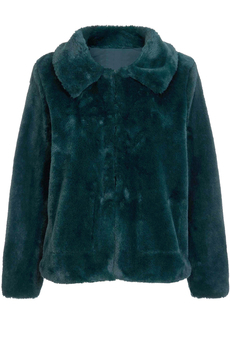 Cropped Faux Fur jacket is perfect for day-time and evening looks. Luxurious, butter-soft and cozy, in a relaxed cropped boxy-cut shape in an unexpected deep green color has classic collar neckline and concealed loop fastening. It is fully lined and is approx. 60cm in length. Winter collection. Composition: 100% Polyester. Color: Black.